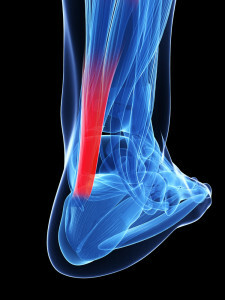 Most Achilles tendon ruptures occur in people between 30 and 50 years old and such injuries are often sport-related. If you suspect an Achilles injury, it is best to apply ice, elevate the leg, and see a specialist. The Orthopaedic Associates of St. Augustine offers the experience of board certified orthopaedic surgeons as well as a board certified podiatrist to treat Achilles injuries. Upon arrival one of the first things the doctor will do is evaluate your leg and ankle for swelling and discoloration. You may feel tenderness and the doctor may detect a gap where the ends of the tendon are separated. In addition to X-rays, the calf squeeze, or Thompson test, will be performed to confirm an Achilles tendon rupture. With your knee bent, the doctor will squeeze the muscles of your calf and if your tendon is intact the foot and ankle will automatically flex downward. In the case of a ruptured Achilles there will be no movement in the foot and ankle during the test. Non-operative treatment will consist of immobilization with a cast followed by rehabilitation. Surgical repair is usually reserved for young, middle-aged patients who are active – especially athletes. During surgery the two ends of the tendon are sutured together. After surgery your leg is immobilized in a cast or walking boot and as the tendon begins to heal, your doctor will recommend physical therapy to restore mobility, strength and function. Complete rehabilitation will take between four and six months. Our Foot and Ankle Center features experienced doctors who are capable of treating numerous conditions. Call 904-825-0540 to make an appointment today.